Note the water pressure on your filter. Turn off your pump at the circuit breaker. We recommend that you do this by pushing the GFCI test button and then click the circuit breaker to the ‘Off’ position. This ensures the GFCI protection breaker is still working. Turn off all of your ‘Stops’ or ball valves on both your suction manifold AND your return manifold. 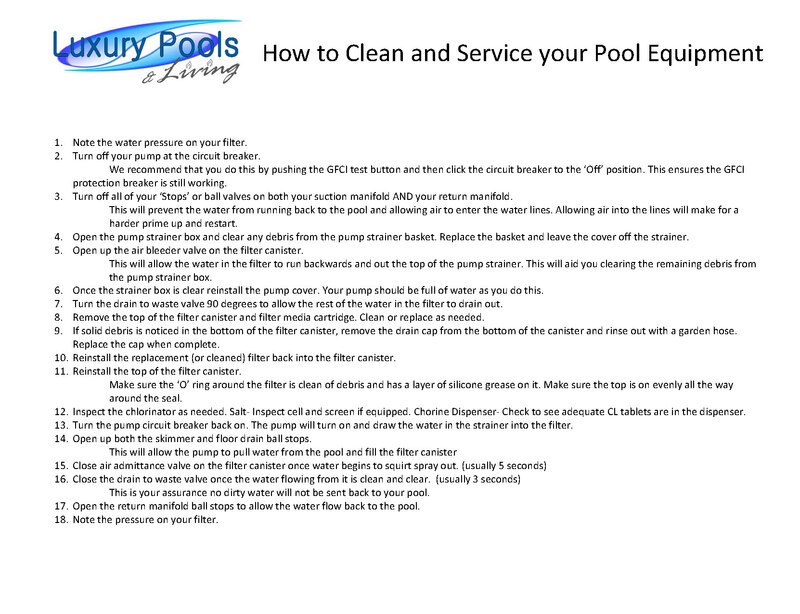 This will prevent the water from running back to the pool and allowing air to enter the water lines. Allowing air into the lines will make for a harder prime up and restart. Open the pump strainer box and clear any debris from the pump strainer basket. Replace the basket and leave the cover off the strainer. Open up the air bleeder valve on the filter canister. This will allow the water in the filter to run backwards and out the top of the pump strainer. This will aid you clearing the remaining debris from the pump strainer box. Once the strainer box is clear reinstall the pump cover. Your pump should be full of water as you do this. Turn the drain to waste valve 90 degrees to allow the rest of the water in the filter to drain out. Remove the top of the filter canister and filter media cartridge. Clean or replace as needed. 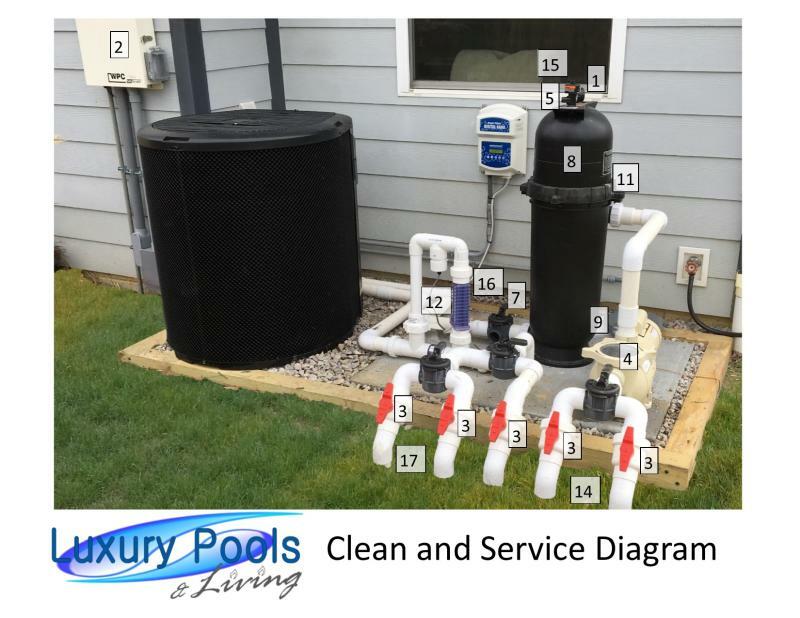 If solid debris is noticed in the bottom of the filter canister, remove the drain cap from the bottom of the canister and rinse out with a garden hose. Replace the cap when complete. Reinstall the replacement (or cleaned) filter back into the filter canister. Reinstall the top of the filter canister. Make sure the ‘O’ ring around the filter is clean of debris and has a layer of silicone grease on it. Make sure the top is on evenly all the way around the seal. Inspect the chlorinator as needed. Salt - Inspect cell and screen if equipped. Chorine Dispenser - Check to see adequate CL tablets are in the dispenser. Turn the pump circuit breaker back on. The pump will turn on and draw the water in the strainer into the filter. Open up both the skimmer and floor drain ball stops. Open the return manifold ball stops to allow the water flow back to the pool. Note the pressure on your filter.